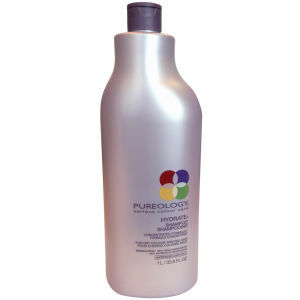 Pureology Pure Hydrate Shampoo (300ml) has been specially formulated for effective gentle cleansing of colour-treated hair. The sulphate-free moisturising formula provides essential hydration to hair, leaving it luxuriously smooth and lustrous. With built-in exclusive AntiFadeComplex, Pureology Pure Hydrate Shampoo nourishes hair whilst protecting vibrancy of colour and shine. The formula, with coconut, corn and sugar extracts, protects follicles and preserves colour. 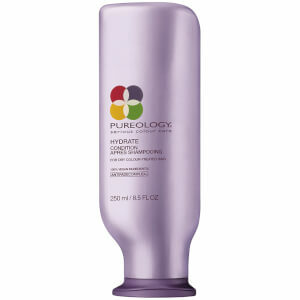 Containing natural plant extracts from rose, sandalwood and green tea, Pureology Pure Hydrate Shampoo promotes naturally healthy hair through concentrated natural conditioning. The signature aromatherapy blend incorporating anise, ylang ylang, bergamot, and patchouli creates a spa-like experience to help you relax and unwind after a long day. The extra-gentle cleansing formula does not strip colour.